A hydrogen ecosystem could harness the skills of both the country's petroleum and renewable energy sectors, Hiringa Energy chief executive Andrew Clennett says. Clennett says the country's integrated economy - with interconnected gas and power networks and abundant natural resources - combined with a culture of innovation means New Zealand is well-placed to commercialise hydrogen. "We're a wonderful microcosm of an OECD country. We've got all the bits and they're all connected. We've got the gas networks, we've got the power networks, we've got the renewable energy sources." Clennett made the remarks last Friday during a talk entitled "Power to X: The Role of Molecules in the Next Generation of Energy" to an audience of about 40 at the BusinessNZ Energy Council. His talk included the potential for hydrogen to serve as a fuel for industrial feedstocks, the progress of carbon capture and storage technology, global investments in hydrogen, and the potential for New Zealand to export the fuel. He also favourably compared the "nimbleness" of New Zealand businesses to that of his native Australia. "One of the things that Australia doesn't do is business elegance. They just do big." Blending Clennett, a former Todd Energy executive formed Hiringa with his wife Catherine and three other energy professionals last year. The firm has been working with businesses including a major transport firm to identify a potential market for hydrogen. He says the company was established in Taranaki to take advantage of skills on offer within the region's hydrocarbon sector. "Upstream oil and gas has got great consenting skills, has got process skills, good welding skills for pipes. All these things we need for hydrogen." He noted that other parts of the country have developed skill sets in relation to electric vehicles and renewable energy which could be harnessed. Hydrogen offered the opportunity to combine those skills for the benefit of "NZ Inc" and bridge both the hydrocarbon and power sectors. "It's about thinking how could we build an NZ Inc with this tool." The fuel could primarily be produced using natural gas. That would require the use of carbon capture and storage to reduce emissions which, Clennett notes, may be falling in cost. Recent Canadian research found carbon extraction could cost less than USD $100 per tonne of carbon captured. Hydrogen could also be produced from renewable energy sources via the grid using electrolysis. It could be used as an industrial process feedstock, a fuel for process heat, and as a fuel for heavy vehicles which must be able to travel long distances before refuelling. Methane - which is contained in natural gas - could be used to produce hydrogen through thermal processes such as steam methane reformation. 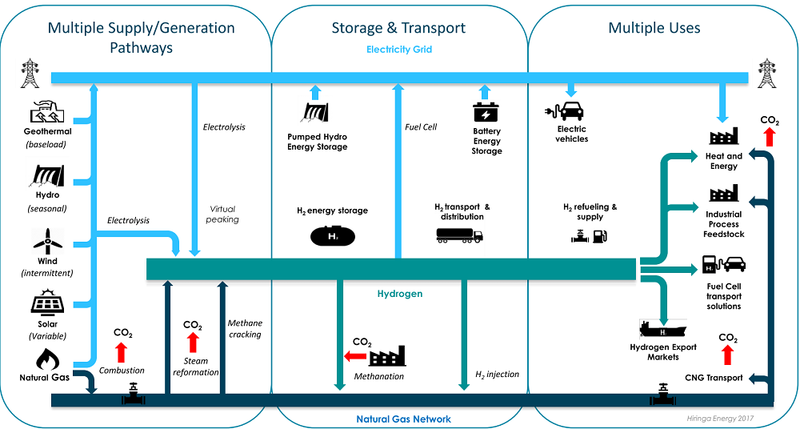 Other end uses for hydrogen include as heat power storage or as an export to overseas fuel markets. The Government announced last month that it would grant $950,000 to Hiringa Energy and its partners to help develop hydrogen fuel infrastructure in Taranaki. The funding will be used to scope the engineering and design of two hydrogen generation facilities, up to four mobile compressed hydrogen storage and distribution containers, and up to three hydrogen refuelling stations. He says the global drive to reduce emissions means the timing is good to pursue hydrogen. He also highlighted several global developments including the establishment of the Hydrogen Council - an organisation formed with 25 major corporations planning to spend 1.9 billion euros per year over the next five years. He also notes recent moves in Japan to encourage the fuel and the Leeds City Gate project. The Leeds project has investigated the feasibility of converting the UK city's entire gas network to hydrogen. It found the cost of the conversion would be about £2 billion. Pilot studies, such as the H21 project, are being conducted around the world including in Adelaide, Perth, Hong Kong, China, Japan, the Netherlands, France, Germany, Norway and Canada. Clennett says such international developments are also helpful to New Zealand which could adopt the most useful hydrogen technology available. "We can learn from what else is working."